Every workshop is facilitated by at least two certified professionals, as well as a herd of horses. Our team observes carefully the dynamics of the group and helps them navigate the path toward discovery and insight. Melissa Anderson is a licensed clinical psychologist with over 20 years of working with groups. She has consulted and facilitated groups for leaders and members of organizations and schools as well as facilitated long term groups focused on leadership and positive self-esteem for adolescent girls and young women. She is particularly focused on effective leadership that allows even the quietest of voices to be drawn out and heard in a way that enhances the whole team’s effectiveness and breadth of creative impact. Amanda Graham, MS, LPC, has worked for the last 6 years at the executive level in a large behavioral health managed care organization, building new departments and teams, creating and leading new initiatives and seeing them through to successful completion. Clinically, she has spent thousands of hours in practice as a Licensed Professional Counselor, helping people face some of the toughest issues of their lives. She is skilled at holding space for people in a variety of settings and facilitating their growth and learning. 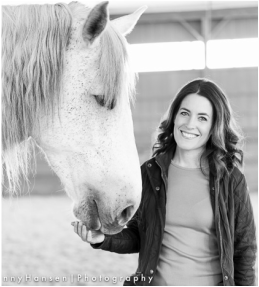 “My passion has always been people and animals, and I have incorporated both into my equine assisted learning and professional development practices, using the Eagala model.” Amanda brings a breadth of experience, ability, and expertise that helps people and organizations meet their pain points head-on to find creative and long-lasting solutions. At WorkHorse, we practice the Eagala Model® of equine-assisted learning. Founded in 1999, Eagala is the leading international nonprofit association for professionals incorporating horses for to meet the professional development needs of people. Eagala sets the global standard due to a strict commitment to standards, a code of ethics, continuing education, and a replicable framework. With over 2,500 certified members in over 40 countries, WorkHorse is able to draw upon this global network as a resource at virtually any location. ​With 19 years in the field, the Eagala Model is tested and subject to ongoing research. To learn more about Eagala and review published research, please visit www.eagala.org.